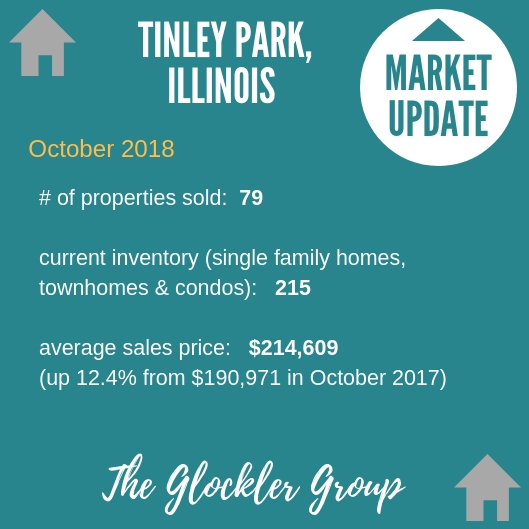 Hello, here is your October 2018 residential real estate market update for Tinley Park, Illinois brought to you by The Glockler Group. October Property sales were 79, up 3.9% from 76 in October of 2017. October 2018 sales were at a mid level compared to October of 2017 and 2016. The Average Sales Price in October was $214,609, up 12.4% from $190,971 in October of 2017 and down -1.2% from $217,228 last month. October 2018 Average Sales Price (ASP) was at the highest level compared to October of 2017 and 2016. The Total Inventory of Properties available for sale as of October was 215, down -10.8% from 241 last month and down -24.0% from 283 in October of last year. October 2018 Inventory was at the lowest level compared to October of 2017 and 2016, which is more beneficial for sellers.